Phobia of the dentist is a common problem, and one that Dr. Barsky and the rest of our team understand well. However, while being sensitive to this issue, we also want to ensure that patients receive the dental care they need to maintain a healthy and happy smile. That is why we offer sedation dentistry options, which can help take the edge off of these negative emotions and allow patients to enter a deep state of relaxation during their procedure. This is a great option for patients who dread coming to visit us because it can be taken in the home before you even leave for our office. At your initial examination we’ll provide you with a prescription for an anti-anxiety medication, and instructions regarding when and how to take the medication. For patients with more severe anxiety, this is often a better choice as patients report not remembering the visit after they leave and feeling less pain during their recovery. Any patient who needs a complex or time consuming procedure should consider oral conscious sedation to help reduce pain and discomfort. Oral conscious sedation is also great for patients who have special needs and may not understand their treatment which could cause unnecessary fear or stress. 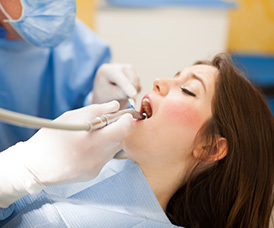 We hope that you will choose to make Aesthetic Dentistry of South Miami your oral health care home thanks to our experienced staff and our dedication to the latest tools and techniques in the dental field. Contact us today at, (305) 667-7543 if you have any questions, or if you are ready to schedule your first appointment. Patients from all over Miami and beyond are welcome!